Aaaaaaaand I just got my ticket to see them in March in San Diego. I just checked his site and he's only going to ***gy, pinko cities. On the night of September 10th, I was in Raleigh attending the Hopscotch music festival. At 12pm, William Basinski, the artist behind the beloved series of minimalist albums, The Disintegration Loops, was playing at Nash Hall, so I hopped aboard one of the city’s passenger bikes to make the multiple block trip from seeing Andrew Bird on the other side of the city. I arrived and tipped for the long journey, walking into a small space that operated as a community chapel normally, Nash Hall. Arriving early, I occupied myself by looking through the merch table, as well as surveying the venue. It was very minimalist in it’s design (mirroring that of the artist interestingly enough), composed of a hall as the opening and a single white boxed room lined with glass windows on two sides. The stage, a low lying wooden platform front and center, was where a table sat for the artists performing to use. A sound engineer was at the back of the room, working with lights and the mixing. The current act played their final notes to a small crowd on cold metal chairs. 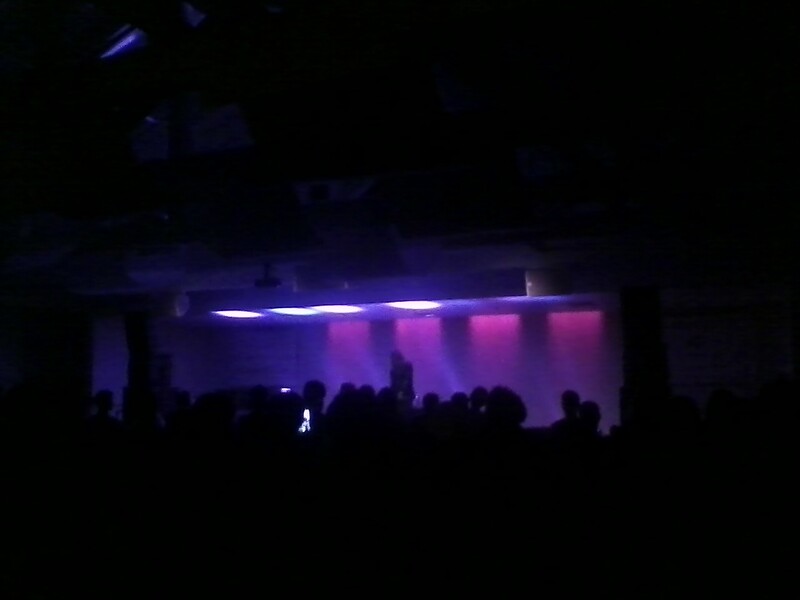 Most of the attendees stayed for Basinski’s set, retaining their quiet introspection. I saw no phones recording the event or disruptive behavior, tonight it was all about the music and the emotion that it engulfed you with. I sat down to a dark room filled with purple lights and waited for the New York legend to make his appearance. A few minutes later, he came out, donning multiple rings and a fashionable black overcoat, and announced the 3 part piece he was performing as a tribute to the late David Bowie, titled “A Shadow in Time… For David Robert Jones”. He was playing this set on a combination of a tape loop, mixing board, and Macintosh computer, I suppose manipulating the sounds digitally as they read out on the tape. Having heard some of The Disintegration Loops prior, I knew what to expect going in. Long droning textures, beautifully arranged modern classical compositions drenched in reverberation, and soul-crushing emotion portrayed by seemingly simple concepts. He certainly delivered all of that and more, being among my favorite acts I saw at the 3-day event. He began the set with the push of a few buttons, and faintly, the music began to come into focus. The first act began as a heavily reverberated string section, slowly increasing in volume. The section consisted of a looped phrase, common in the minimalism genre, not varying noticeably in volume or notes played. The melody was soft, upbeat, and hard to discern due to the heavy reverb. A few stray notes of dissonant, sweeping noise accompanied it occasionally, perhaps randomly assorted. A distorted buzz was also apparent, but it was soon seen to be a mistake, as he fiddled with his soundboard to shut it off after a while, and raised his hands triumphantly as the focus went back onto the barely recognizable strings. At around 5 minutes, it had continued droning on, eventually reaching a volume of mezzo forte, which it remained for a few more minutes into the piece. Suddenly, a new sample emerged in the piece, distortion that resembled, and may as well have been vocals before being heavily manipulated. The sample sounded much like a deadpan voice, and had a similarity to the chorus of “Starman”, being first evidence of the piece's Bowie theme. At the end of the sample was an ominous horn motif that grounded the entire piece in a more sinister tone than when it first began. 15 minutes into the set, it became a much different song, as the strings were reduced to a low buzz with spikes of washing, reverberated ambience appearing sporadically. The vocal and horn motif continued into the next section, becoming slower as it developed and seemingly less distorted. The horn motif grew from a short howl of a single note to an alarming, elongated play on the same tone, making the piece feel uneasy and darker by the second. The voice also warped into a bouncy echo around this time, giving it a feeling of psychedelia and giving the piece a strange, otherworldly feel. In the sense of the tribute, I feel this simple addition to the piece spoke volumes about Bowie’s personality, and how he was a mysterious figure who would change by the minute, never being tied down to the rules of the status quo. The modulation of the vocals then faded into the background, as the sharp sound of strings appeared and wavered over the music. The horn motif also grew to feature another note, which seemed to signify the wrapping up of the piece and completion of Bowie’s life works, as what he had set out to accomplish in life was reached. The music grew quieter and quieter, and soon only a low drone of noise was left in the background. It then turned to silence as the music rested, until suddenly the next development began in a burst. A more upbeat section of strings began, accompanied by piano. This soon changed, however, as the piano riff became more clear, and featured a darker tone than what it previously hinted at. This section, as opposed to the previous one, didn’t feature much variation in dynamics or even introduction of new motifs, mostly following the same looped section of strings and piano until near the end, when the strings faded away and the piano was left playing for around 5 minutes until it went silent. The rhythm was soft as well, being not overly pronounced, and giving it a dreamlike quality. I feel this was the most impactful part of his set, perhaps symbolizing that Bowie’s music and influence would continue on and on, showing it’s beauty as well as it’s controversial moments, where the listeners would be challenged and learn to grow and love it for what it was. The final piano left, to me, reflects the final album Bowie released, which came out on a rather low note but was revered as legendary days after his death, much like the piano started as just a piece of the background near the beginning of the section, but revealed its beauty at the very end. The set then faded out quietly, ending on this note. This performance, being among my favorite that I saw at Hopscotch, impacted me in a way quite different than the other acts. This journey through the feelings Basinski had about Bowie and the way he arranged those into a truly impacting piece told volumes about how his own emotions shaped his music into captivating pieces full of meticulously created melodies and drones. I would recommend seeing him to anyone who likes something a little different than the norm and is ready to experience a heartbreaking musical journey through quiet ambient minimalism. The concert I was going to in June got cancelled after being postponed last June.